The extension is based on a separate project that I was recently working on for an adaptive information systems course. For my project, I implemented a Chrome extension that learns a user model based on the sites a user visits. 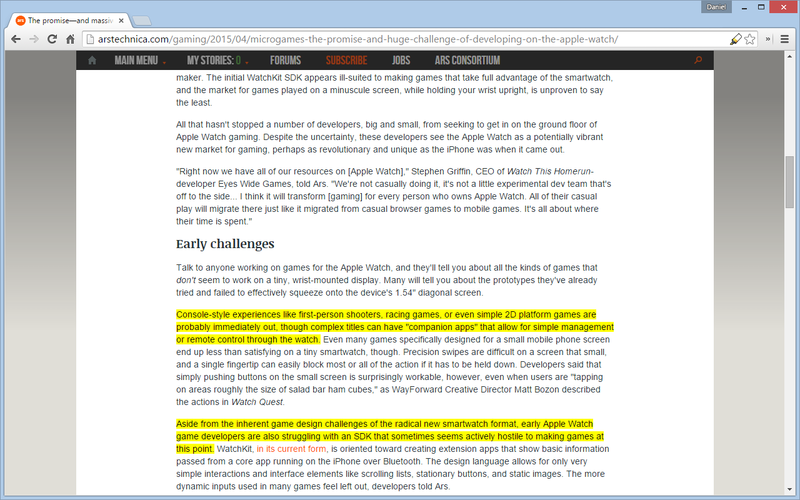 Then on new sites, content was highlighted based on the similarity to the user model. I called the project extension Persightlight, for “personalized highlighting”. The personalization component still needs more work, and it added complexity to the code. Auto Highlight is based on Persighlight, but all the user modeling and personalization code has been removed. Auto Highlight uses a heuristic that gives higher weight to words that appear often, rather than depending on a user model. I’d like to improve Auto Highlight, adding ideas from recent NLP research. Persighlight essentially did extraction-based automatic summarization, scoring sentences relative to a user model. The model was represented by a term frequency vector, as were sentence candidates. Candidates were scored based on their cosine similarity with the user model. I’d like to also continue work on Persighlight. It would be interesting to see how personalization with a user model can contribute to highlighting, and summarization more broadly.